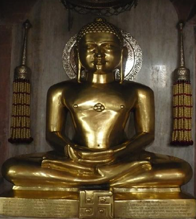 Suparshvanath in his previous birth as king Nandisen of Kshetrapuri did harsh penance and deep spiritual practices. He then reincarnated as a god in the sixth Graveyak dimension. From the dimension of gods this soul descended into the womb of queen Prithvi Devi, wife of king Pratishthasen of Varanasi. One fine morning King was sitting with other honored members of the kingdom. They were serious as all four sides of the kingdom were endangered by the neighboring kingdoms who were ready to attack. Another fine morning king Pratishthasen after offering his daily prayers was studying about the dreams and by chance the chapter on Tirthankara’s mothers dream opened. Suddenly Queen Prithvi Devi approached him and asked what the King was up to and if she had not disturbed him. King welcomed the queen and told her what he was reading. On hearing the topic, queen Prithvi asked the king of she could read the same. Happily the king handed over the book to her. As queen went on reading the glow on her face went on increasing. She said, “Dear! Very early this morning I too had these dreams”. Hearing this the King said, “You are very lucky that you have got a chance to be a Tirthankara's mother and because of you I have got the honor of being a Tirthankara’s father”. At the same time the army captain (Senapati) of the kingdom came there with the kings of other kingdoms who were very eager to become their friends as they needed Pratishthasen's support to fight with other neighbouring kings. Time passed by and the Queen gave birth to a son on the 12th of Jyeshtha Shukla Paksh 12 according to Hindu Calendar. Everywhere there was happiness and an atmosphere of friendship and brotherhood. Now the Prince Suparsh had grown up and was married. He had many wives. His nature had all the softness, quietness, politeness etc. He was a serious kind of a person. His father one day decided to make prince Suparsh - King Suparsh. After completing all the formalities of the ceremony Pratishthasen started his way for Himalayas for the purity of his soul. Now, Suparsh was the king as was leading a life of an obedient son, able King and generous person. He actually became King for the service of mankind. He ably conducted the affairs of the state and looked after the well being of his people. One day king Suparsh was enjoying the nature sitting at the roof top when suddenly he saw the falling of leaves and wilting of flowers. As if an entire movie is being played, Suparsh saw all of past births and understood the real meaning of his this birth. He became aware of the transient nature of life and this awareness made him feel detached with all the worldly things and desire for spiritual upliftment. He decided to transfer the responsibility of the kingdom to his son and move to his true ways. After a year’s donation of wealth he came out of the castle and removed his hair with his fist, removed all the worldly possessions , uttered the words “Namo Sidhanam” and disappeared in the crowd. Along with him thousands of other men and women, kings and servants did the same. After nine months of disciplined practices he became an omniscient on the sixth day of the dark half of the month of Falgun. For a long period he worked for the spread of right knowledge. He got liberated on the seventh day of the bright half of the month of Falgun at Sammed shikharji.